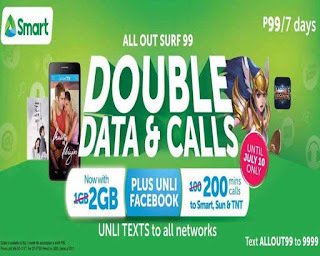 You can save your budget when your load the latest Smart All Out Surf 99 promo, your 99 pesos can already cater all your communication needs up to 7 days. From texting, calling and surfing all in one combo promo with one-time registration. The good thing with Smart ALLOUT99 is that they double the data and calls so we can enjoy this offer without increasing the price. 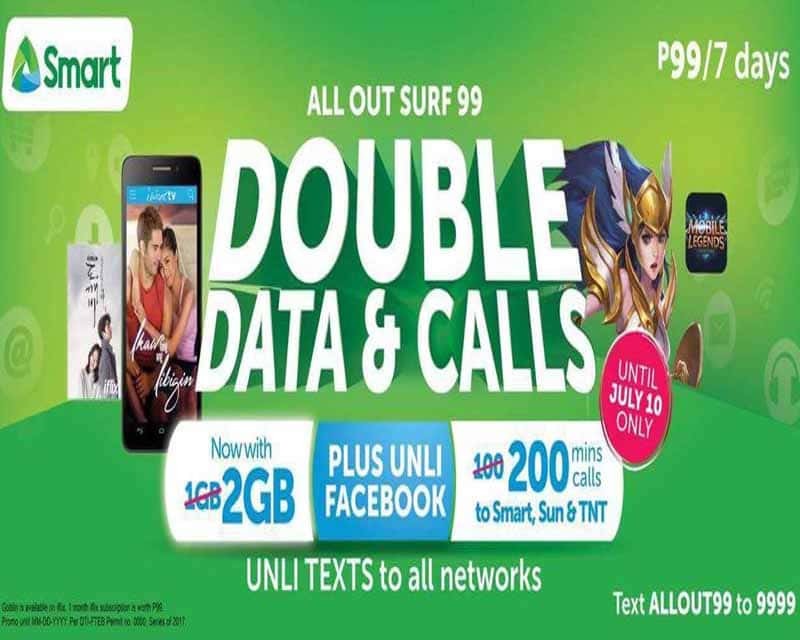 If you’re a Smart prepaid subscriber, you can benefit this additional 1GB of mobile data and 100 minutes of calls to Smart, Sun Cellular and Talk N Text (TNT). Registration can be done via SMS keyword or you can ask your retailer to directly load it to your Smart prepaid number. Compare this promo to Globe 2GB data + unlitext to all networks for only 90 pesos, check out GOTSCOMBODD90 valid up to 7 days. You can check out other denominations of All Out Surf Promo Offers - Unlitext to All, Call and Data. Note: This double data and calls of ALL OUT 99 promo is limited time only that runs until July 10, 2017. For updates you can check Smart social media pages and website to know if they will extend this offer or not. If you’re using a dual SIM phone, make sure to correctly configure and set the right Smart APN on setting to avoid internet connectivity issues. Since you only have limited bandwidth on this promo, be sure to check how to save mobile data by restricting background apps on your smartphone.